I've built a 3d Stratigraphy model and now need to clip 2 of the surfaces based on a polygon boundary (the 2 surfaces have interpolated across the whole project site where in reality, one formation ends and the other begins). I've made the polygon table file and successfully imported it, using the Grid Polygon Filter, so that the area clipped is right. It looks correct in plan view but seems to automatically "extrude" at a much greater depth than the original "top" or "base" surface. I've attached a jpeg of the screenshot. I've tried clipping both the top and base surfaces for this formation and am getting the same result each time. 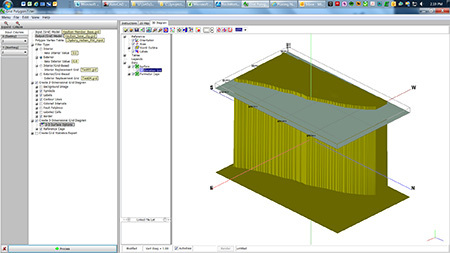 The PDF attached shows the model with vertical offsets for the formation layers and instructions about where and which surfaces need to be clipped. Am I taking the right approach to clipping the surfaces, or is there a better way to do this? Thanks for any and all assistance. It is really hard to know what the problem is without looking at your data, but I do have one idea about what might be happening. When you clip the top and base grids with the polygons, what values are you assigning to the cells outside of the polygons? You should be assigning a null value (-1e27). In the image you've sent, it looks like you might be assigning values of 0 instead. If this doesn't resolve the problem, it would be helpful if you could zip up your project (including your grids), and send it over to tech @ rockware.com. I think that we should be able to resolve this by taking a look at the model files. Thanks very much, Alison. That was the problem - changing "0" to the null value fixed the "extrusion". I'm wondering if there's now a way to add "sides" to the clipped stratigraphy top and base surfaces, so that it shows the thickness of the formation? (It's the Battleford FM in my model - please see the attached jpeg). 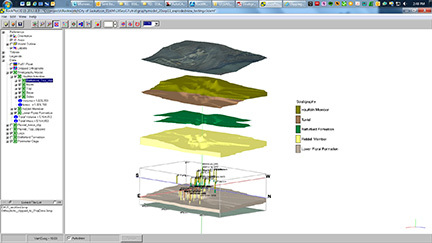 You should be able to do this by rebuilding the Stratigraphy Model with the "Interpolate Surfaces" option checked off. This will use the modified grids to rebuild the stratigraphy model (including the side panels). If you continue to have problems, please let me know. Once again, Alison, you've come to my rescue with a solution that works "like a charm".